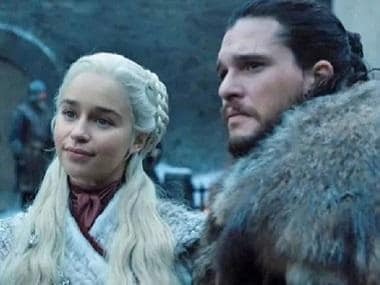 In the highly anticipated first episode of Game of Thrones season eight, the Mother of Dragons meets the Starks and Daenerys’ encounter with Sansa Stark has got fans hyped on Twitter. The friction between the two characters was previously teased by HBO in a promo where a tense Sansa told Danny, “Winterfell is yours, your grace.” The first episode serves everything the fans were dying to see. The particular scene, where Sansa Stark (Sophie Turner) asks Daenerys Targaryen (Emilia Clarke) what dragons eat and gets the sassy reply, “whatever they want,” caught the most attention from the fans. In the latest episode, Daenerys rode into Winterfell alongside Jon Snow (Kit Harington) with her army and dragons. It’s there when Sansa and Dany meet. Jon also reunited with two of his siblings for the first time since he left Winterfell and it was his emotional reunion with Arya Stark (Maisie Williams) after eight seasons that thrilled fans. Fans will now have to wait until next week to find out how the tension between Daenerys and Sansa unfolds. Read what the preview of Episode 2 reveals.